As I’ve come to the end of my very interesting and enjoyable stint in Community Reuse Network (CRNI), providing maternity leave cover for the National Coordinator, it’s a good time to reflect on what’s been happening in the green economy in the last few months. There have been some very positive developments, both in Ireland and abroad. The Forum on Food Waste was hosted by the Stop Food Waste team in the EPA, which highlighted the great work being done by Foodcloud, CrossCare and other food banks, to ensure that food, which might otherwise be wasted, gets used and by those people who most need it. I particularly welcome the Conscious Cup Campaign, tackling one of my bugbears, disposable coffee-cups. My own reusable cup got plenty of (re)use as I trotted down North Great George’s Street three times a week to get my morning caffeine hit. It’s worrying though that in the nine months I did that, there wasn’t another single customer in the café with a similar cup. For myself, I’ve discovered the joys of charity shop shopping. Not being a shopper at all, I dreaded the thoughts of going into any shop and having to look through racks of clothes. But actually, they’re generally well laid out with specific types of clothes / sizes / colours grouped together which makes it easy and quick to look through the available items. Can’t do much better than a Versace jacket for €40! Consultations kept me busy too, and I made submissions on microbeads, the Dept of Transport National Adaptation Plan and the RHI. While these take some time and effort to put together, I take the view that they are always worthwhile; it’s difficult to complain about something after the event, if you haven’t voiced your opinion when asked! And let’s not forget the ambitious renewable energy and recycled materials announcements made by several corporate behemoths since the start of the year. As always though, there is more work to be done; it’ll be interesting to see whether the decision, to withdraw the US from the Paris Accord, will have a positive or negative effect. To date, this unilateral action appears to have galvanised swathes of countries, cities and even US states to plough on ahead with initiatives to tackle climate change. 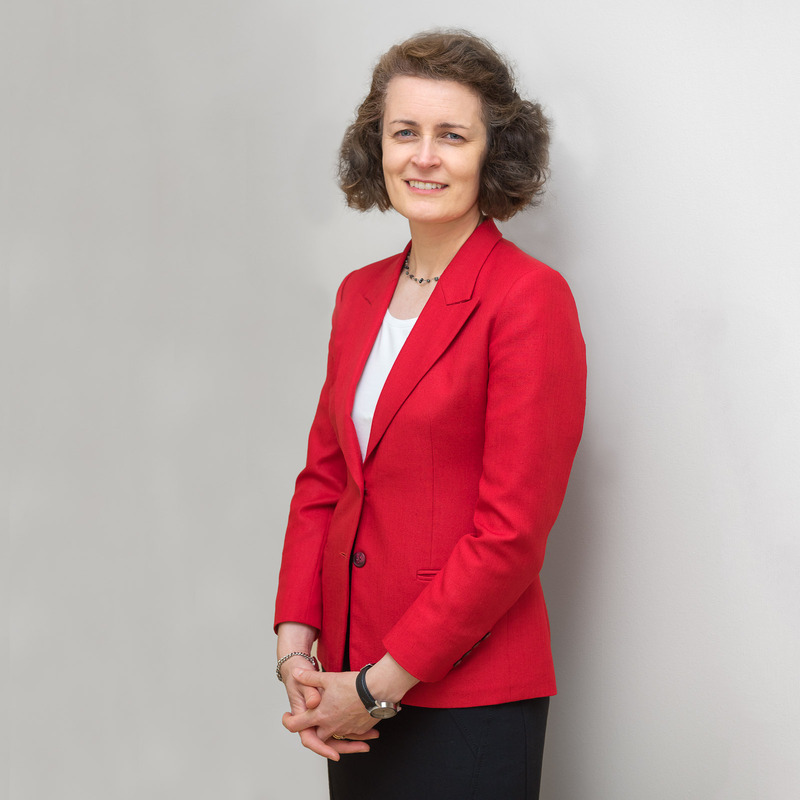 As for me, I’m looking forward to undertaking more research projects – as usual, a lot done but a lot more to do to keep working towards a low-carbon, green economy. It doesn’t seem that long ago since trying to find a decent cappuccino in Dublin was a chore. Now, the proliferation of cafes and coffee stalls means that you’re never more than an arm’s length away from a large/tall/grande double skinny latte (remember when you used to just ask for a coffee!). While this is good news for coffee sellers, it’s bad news for the environment as that takeaway coffee cup you’ve just used is probably not compostable (they do exist but I know of only one café in Dublin using them), and is very difficult or impossible to recycle (due to the lining of polyethylene which is required to keep the liquid inside hot and to stop it from leaking). It’s most likely that the cup will end up going to landfill where it’ll take several hundred years to break down. 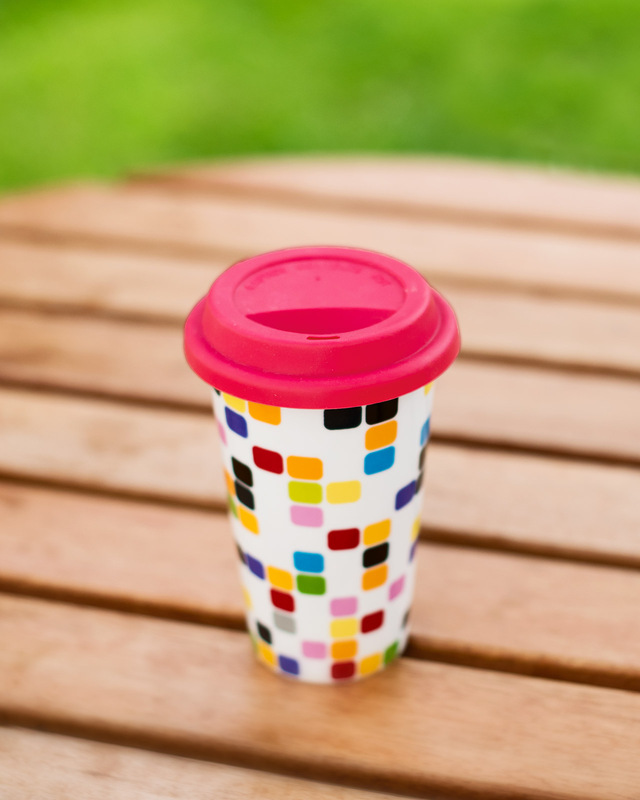 If you’re a regular takeaway coffee (or tea for that matter) drinker, why not invest in a re-useable coffee cup? There are any number of styles to choose from (mine is pictured above). Buying one not only reduces the number of these cups being used and disposed of but also, and you can take my word for it, the coffee tastes infinitely better. Now let’s assume that there 20 such coffee stalls operating in Dublin, 10 each in Galway, Cork and Limerick = 50 x 48,000 = **2,400,000** cups annually. That’s a lot of cups, many or most of which may be going to landfill. I haven’t even looked at the number of takeaway cups used by cafés, of which there are hundreds around the country – if you include these that 2.4m figure would probably increase a number of times. Makes you think doesn’t it; if everyone bought a re-useable cup, how much could that figure be reduced by? Have you ever wondered if all that stuff you read about glacier retreat is true? Sometimes the statistics are so alarming it’s hard to believe things could be that bad. And if the retreat is happening that fast, is there anything we can do to try to slow it down? A recent trip to the French Alps afforded me the opportunity to see the effect that climate change is having on the magnificent glaciers around Mont Blanc. The Mer du Glace (sea of ice) became a tourist destination back in the late 1800s, when pack mules were used to bring Victorian tourists up to see this enormous glacier, perched as it was then over the village of Chamonix. By 1908, travellers could use the newly-built cog railway to make the ascent to the bottom of the glacier. A hotel was then built above the glacier to accommodate tourists, such was the demand. Hard to believe then, that in the space of 100 years or so, the bottom of the glacier can now only barely be seen from the hotel’s terrace; when the hotel was built, the terrace afforded the best vantage point of where the glacier gently rolled to a stop. But in less than 30 years, the change in the Mer de Glace, and its near neighbour, the Bossons Glacier, is quite breath-taking. 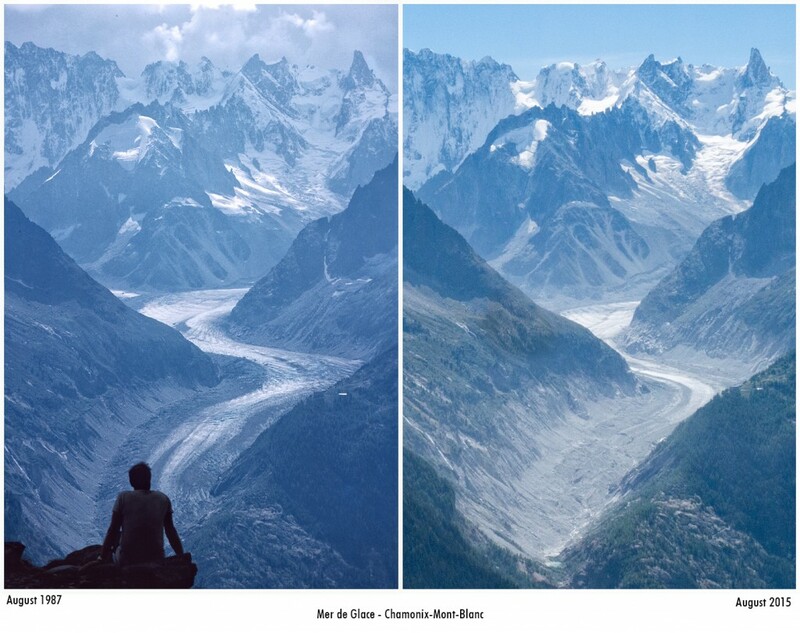 Take a look at the “Then and Now” photographs below to see what glacier retreat looks like up close. Glacier retreat is a naturally occurring phenomenon; the rate at which these and other glaciers worldwide are receding is faster though than nature intended, and much of it is due to climate change. The glacier can now only barely be seen from the Montevers Hotel. A red circle highlights this 3 storey building about 5km from where I was standing for this photo. But it’s not too late to try to slow down this grim march. Getting involved in the discussions around the COP21 talks in Paris, taking public transport instead of your car, investing in a re-usable water bottle and coffee cup might seem small in the grand scheme of things – but if we all do small stuff, it can lead to an improved environment, especially for those glaciers. The Mer De Glace drains the north side of Mont Blanc. This is the largest glacier in this section of the Alps at 12 km in length. At Montenvers, the glacier has thinned 150 meters between 1820 and 2004(1). 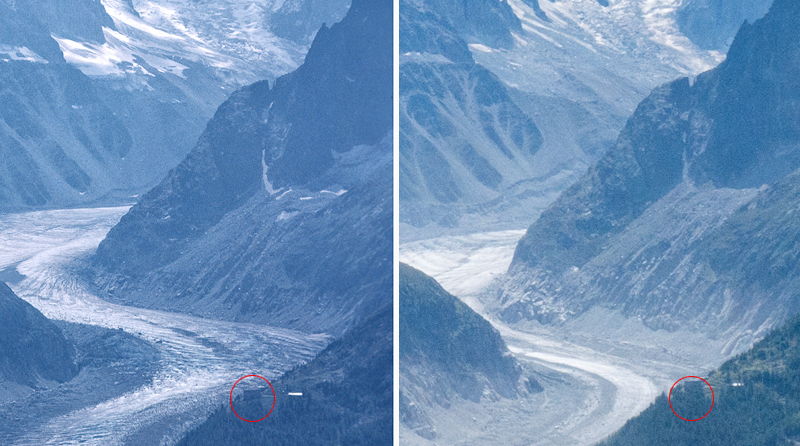 In latter times, the glacier has lost 70 meters in thickness at Montenvers between 1990-2010, as it has retreated. Between 1994-2008 the Mer De Glace retreated more than 500 metres(2). Scientists predict that it will retreat by a further 1,200 m by 2040, and that this figure is likely to be a minimum(3). Authors: Vincent, C.; Harter, M.; Gilbert, A.; Berthier, E.; Six, D.
Save money, stay mentally sharper and lessen your impact on the environment – what’s not to like? Even mild dehydration can cause us to lose our concentration so I try to avoid being in a situation where I don’t have access to water. Since I bought my first reusable water bottle nearly 5 years ago it has travelled to the office, come with me in the car, gone to conferences and even on holidays. In fact, it got so much use I had to replace it recently, at the cost of less than a tenner! So why not buy a good quality reusable bottle (there are lots of options in shops and online), keep hydrated and save yourself lots of money by not needing to buy expensive bottled water. The big winner of course is the environment, with fewer of those single-use plastic bottles floating (literally) around the planet. What are you waiting for?